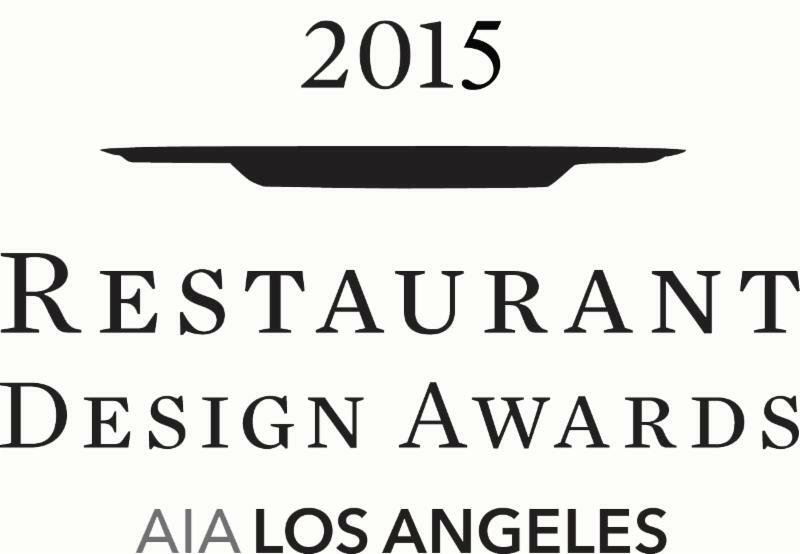 Los Angeles, CA (May 30, 2015) - AIA Los Angeles proudly announced the winners of the Restaurant Design Awards (RDA) in both the People's Choice and Jury categories on Saturday, May 30, 2015 at 5:00pm on the Dwell on Design expo floor at the LA Convention Center. The distinguished jury - comprised of publisher Christopher Gialanella of Angeleno and Interiors California Magazines, architect Andre Kikoski, AIA, and restaurateur/architect Bryan Libit of Stir Market - selected fifteen projects as finalists for this year's competition: 7 in the Restaurant category, 6 in the Café/Bar category and 2 in the Lounge/Nightclub category. After a month of People's Choice voting and almost 3000 votes from across the country, the winners were tallied up and ready to be honored at the awards ceremony. The Restaurant Design Awards are an annual competition that honors excellence in restaurant design. The competition was open to all individuals and practices with both restaurant owners and architects/designers invited to submit. With three main categories, Lounge/Nightclub, Café/Bar and Restaurant, the applicant pool was amazing this year, making our jury's job to choose Jury Award winners and to narrow down the finalists a difficult decision. Our very special celebrity guest, the glamorous interior designer and restaurateur Barabara Lazaroff, ASID, who has become the godmother of the RDA's, hosted the annual awards ceremony, along with introductions from AIA|LA Board of Directors President, Ted Hyman, FAIA. AIA|LA congratulates all the winners! The Restaurant Design Awards (RDA) - created by the American Institute of Architects Los Angeles (AIA|LA) -honor excellence in restaurant design. The competition is open to all individuals and practices with both restaurant owners and architects/designers invited to submit. Either the project itself must be located in the United States or the submitting individual/firm must be US-based. Submissions are accepted in three main categories: restaurants, cafés/bars and lounges/nightclubs. The annual RDA Ceremony recognizes both Jury Award Winners as well as People's Choice Award Winners, as selected by votes collected from the general public on the AIA|LA website.